Submitted by lynn on Thursday, February 19, 2015 - 10:55pm. 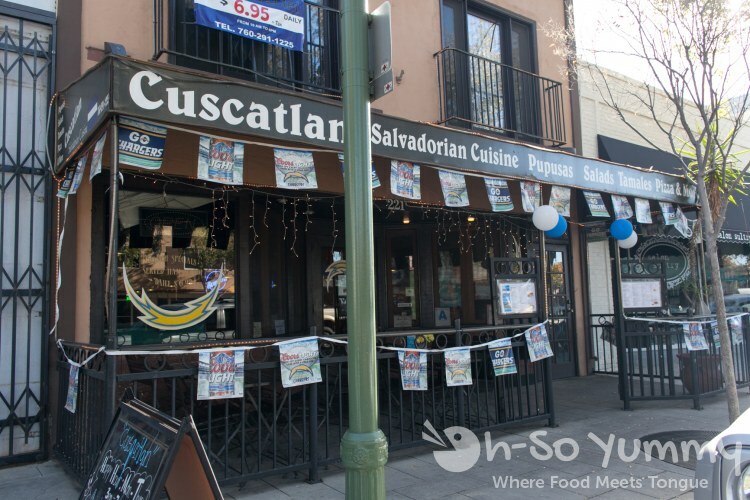 Amongst chocolate, wines, and beers at the Escondido Chocolate Festival, we also sampled our first ever pupusas at Cuscatlan Salvadorian Cuisine. 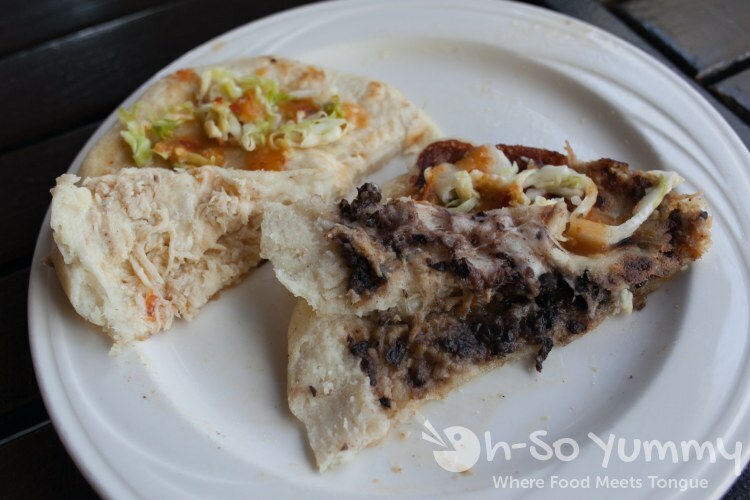 A pupusa is traditional Salvadorian dish, essentially a deliciously thick corn tortilla that's usually stuffed with cheese and meat. Almost a year later, we finally made it back for a full meal at the restaurant! The Cuscatlan Sampler ($13.95) sounded like the best way to start our visit. This monstrous sized plate contained fried plantains, fried yuca with fried pork, 1 corn tamale, 1 chicken tamale, 2 pupusas, sour cream and beans. We thought all of the items were relatively good and began worrying that we'd fill up before our entrees got to the table! 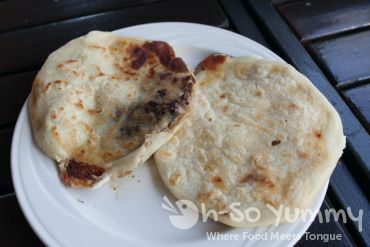 We also ordered pupusas, which looked just like the ones in the sampler from the outside. 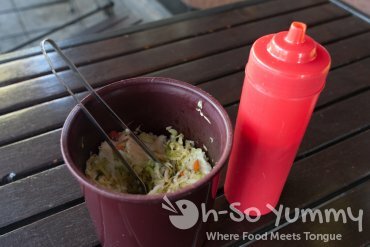 There was also a pickled slaw mix and a sauce to add at your leisure. Cutting them open shows the differences. The top one is chicken while the bottom one is beans and pork. These pupusa were really tasty with the sauce and slaw on top! I liked the pork one best. 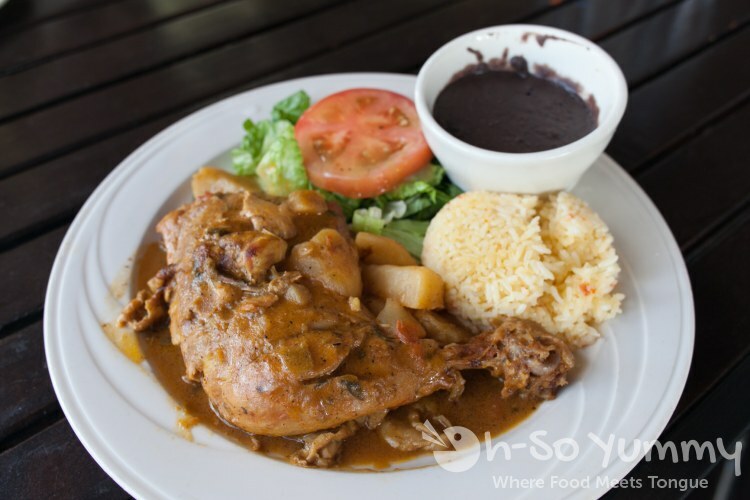 We selected one entree, the Pollo Cuisado (10.95) which was served with rice, beans, green salad. It was moist and delicious stew sauce. We also ordered their large Pesto Chicken Pizza (18.99). Say what? We were surprised that the menu was a mix of Italian AND Salvadorian here but we were definitely curious. 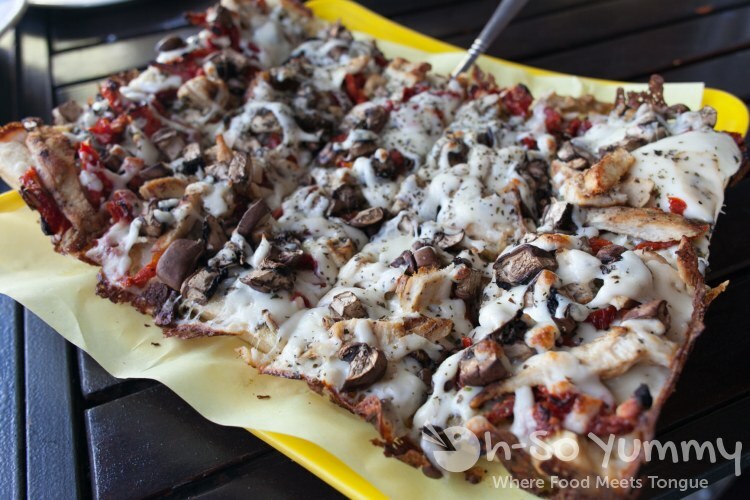 Too bad this particular pizza combination turned out to be incredibly dry between the chicken and mushrooms and cheese. The large size pizza was a bit overkill considering how much other food we had ordered. At least pizza makes for great leftovers. The pupusas are definitely the thing we like here. I've heard that the recipe to make them is quite simple too. Somewhere in our house I have a bag of masa (leftover from a tamale making party) so hopefully I'll find time to do it! In the meantime, there's always this place or the one in south San Diego to try this food out! Gosh I can't remember the last time I tried a pupusa . I drive by Escondido quite often so I'll have to try this place out. The pizza looks like it's on a super thin crust! How was the pizza reheated? $18.99 seems like a lot for that pizza. Pizza was actually on the medium to thicker side. We like warming up pizzas in the toaster oven if possible! Yea it was a bit pricey especially with how the taste turned out. We tried this place a little more than a year ago and liked it. We had a 2 for 1 coupon too, which was even better. There were carbs galore in that combo plate. If you haven't done so yet, there's El Salvadoreno (on Imperial Ave) to try out. Another place is El Salvador Pupeseria in City Heights as well. I still have to try that place. I just found a B1G1 coupon in the 2015 entertainment book so we're probably gonna go back down for food later this year. I definitely want to try the two places you mentioned! I really need to try pupusas at more than one place! I've tried the pupusas at El Salvadorean in Grant Hill, love the ones with cheese in them :))) Surprisingly don't love the ones with meat in them but maybe because they can only add so much filling in them? And I always need lots of the slaw! Those things are heavy though I thought they would be like appetizers when we first got them and after eating two it was like just kidding I'm done now. 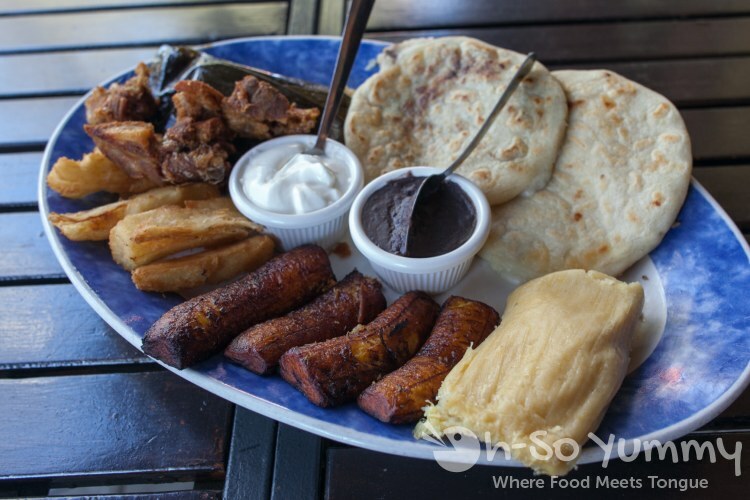 Did you get to try Salvadorean tortillas?? They are like thicker poofy softer tortillas. Soooo good. I spied above there's a coupon for this place - yay! I've been wanting to come here, we have been to the one on Imperial that CC mentioned a number of times and to the one in Grant Hill. I think this is like the only other place I've heard about that has pupusas. Weird that they also have pizza... maybe they are trying to cater to the area. That sampler plate looks like enough food all on it's own! Coupons rock. Maybe the pizza part appeals to the mainstream and once they're in the door, the pupusas are for the 'adventurous' ones. I think the sampler should be shared with four people next time though! Filling!